It’s getting cold outside, so you may want to start assessing your interactive cat toy collection, or maybe you’re looking for ideas for kitty’s Christmas. 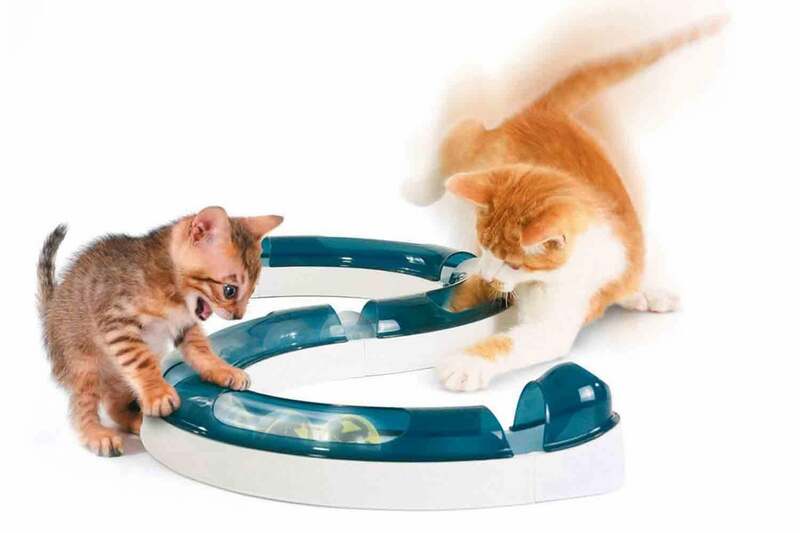 Here we take a look at some of the best interactive cat toys you can buy online. Remember cats need to ideally play around thirty minutes a day, split into two fifteen-minute sessions. Doing this day-in-day-out can work wonders for a cat’s physical and emotional health. You’ll reduce the chance of a fat cat, potentially lessen behavioural problems stemming from pent-up energy, and can even improve your cat human relationship. But sometimes, you may not have 30 mins a day to play with the cat, so this is where interactive toys step in. 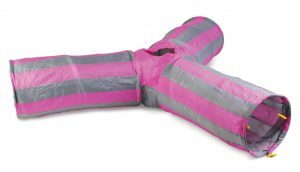 A quality material tunnel that is strong, with vibrant grey and pink stripes….and it’s crinkly, and what cat doesn’t like the sound of crinkleness. The Actcat tunnel has a choice of entry and exit points and the peep hole at the centre point provides our cats an opportunity to rush in, hide then pop up when her humans least expect it. Very funny for all round. There is a playball attachment too. It folds and ties closed for ease of storage when not in use. The nylon fabric seems really strong and we’ll be setting up in the garden next summer too. It’s a really good quality play tunnel at a very competitive price. From Frolicat, Cat + a laser is a sure-fire formula for fun. I have a laser pen, but just not the time sadly to be entertaining the cat all day with it. The FroliCat Bolt projects a laser light on random paths across the room. With 1,665 customer reviews and an overall score of 4/5 on Amazon, the CatIt’s Play Circuit gives hours of entertainment. The premise is simple and effective: the cat chases a bouncy, green ball up and down a trackway with peekaboo openings that let paws through – but don’t let the ball out. It’s a good size, robust plastic, and packs away neatly back into the box. The components, four curved sections of track and two endpoints, can be put together in different combinations to create different shaped circuits, which keeps things interesting for the cats. This psychoactive snake from the mountains of Nepal is a little different. We have a snake from IKEA, so know our kitty loves snakes. 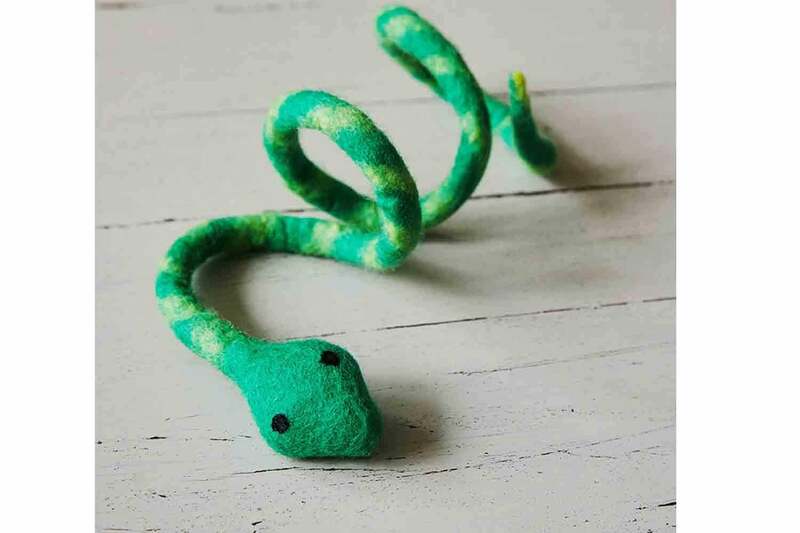 Our feline reviewer Doc loved attacking and sniffing this catnip-scented felt snake, which was made by a Nepalese community group for The Natural Pet Toy Company. We liked it too, thanks in-part to its easy-to-dangle coiled shape, and because it’s great fun to watch a cat wrestle a felt snake. 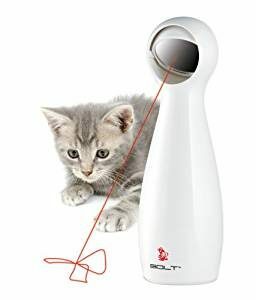 It’s really durable against claws and sharp teeth, and although it’s not got lights or bells, it will keep your cat very entertained as well as provide you with a fair few laughs. The Trixie Solitaire Game is marketed as an ideal choice for elderly cats with limited mobility – offering interactive play without your older cat having to exert itself. It could be likened to a crossword for cats. 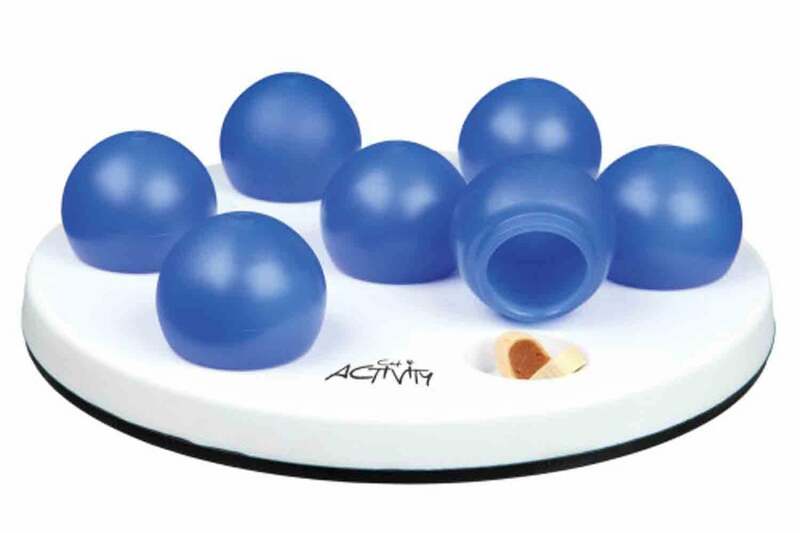 The toy is made up of seven plastic balls which sit on a plastic board. You place a cat treat under one of the balls, then it’s down to the cat to knock over the right one and find the treat. This is a fantastic mental workout for cats, and importantly, seeing that it involves food, it’s easy to clean. Additionally, this toy’s 20cm diameter and sedentary nature would make it a good choice for households with not much floorspace to play with. 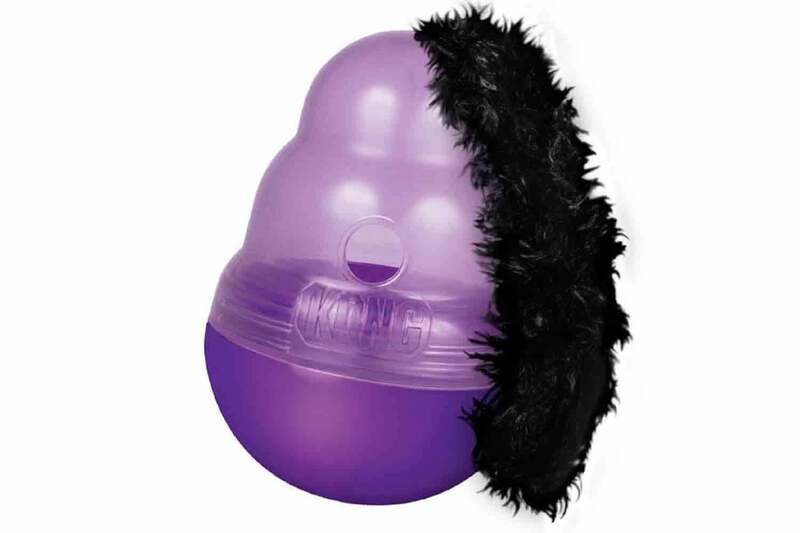 A black feather boa attached to a purple, treat-dispensing roly-poly toy – how cool is that. and definitely a combination which will make cats very happy. You place one or more treats inside, then the cat beats it up until their prize falls through the hole. Not only is this fun for the cat, it’s also an effective way to make them eat more slowly, which aids digestion. The Kong Cat Treat Wobbler is nice and compact at 4.5″ across and 7.8″ tall.